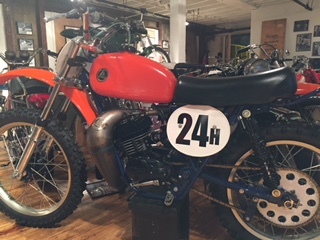 I’m not sure where Jim came across this Super Rat, but he totally rebuilt it, Sun rims, Buchanan spokes, powder coated hubs, engine and frame by John Melniczuk and many parts from Paul Stannard at Strictly Hodaka. Rob Meadows rebuilt the engine — he has a fast cylinder and a normal cylinder! Jim and Bruce Triplett ride it in AHRMA motocross. Beautiful machine!